Welcome to Ayodhya, The Invincible Land, Cradle of Mythology, Philosophy, Literature, Religions and History. It has been the witness to many faiths like Hinduism, Jainism, Buddhism, Sikhism, etc., Ayodhya is predominantly linked in the psyche of billions of masses with Hinduism. The Present City is situated on the right bank of river Saryu in district Faizabad in the State of Uttar Pradesh, India. Ayodhya is about 8 Kms. from the District Headquarters Faizabad and about 130 Kms. from Lucknow, the state capital of Uttar Pradesh. It is situated on latitude 26°48's north and longitude 82°13' east in north India, five miles north-east of the town of Faizabad. Ayodhya is a Sanskrit word, meaning "not to be warred against". Ayodhya is considered to be the birthplace of Lord Ram and a holy place for Hindus. Ayodhya is also a place of worship for Muslims for the famous Babri mosque. Ayodhya has been in the news for the last few years because of temple-mosque controversy. The city, however, is an example of good communal harmony. This place is crowded by nomadic Hindu monks and every year it attracts millions of people from all over the country and the world. In the old age many people come to Ayodhya with a belief that if they die here they will get a place in heaven. This has resulted in very high population of the old in the town. The area has no industrialisation and most of the people are dependent on agriculture for their livelihood. Presence of a couple of sugar factories around Ayodhya, however, has earned this area status of a sugarcane belt. Ayodhya-Faizabad has no airport of its own. Located about 155 km away from the Faizabad city, the Lucknow International Airport or Amausi International Airport connects Ayodhya-Faizabad of Uttar Pradesh with some of the major cities of India such as Delhi, Mumbai, Patna, Varanasi and Kolkata by direct Lucknow flights. The Lucknow Airport with a runway of about 7,835 feet, lies at an elevation of 400 ft and is a hub of both International and domestic flights. Direct train links exist between Ayodhya-Faizabd and Lucknow, Delhi, Dehra Dun, Varanasi,Gorakhpur. 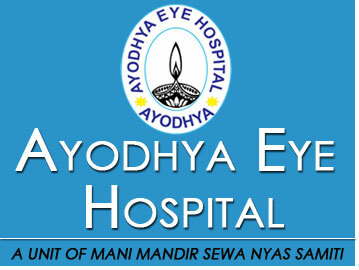 AYODHYA EYE HOSPITAL 2011 All Right Reserved. Design and Developed by : PREVIEW TECHNOLOGIES PVT. LTD.